Grill'em outdoors, stovetop or in the broiler. Melt butter in skillet over medium low heat. Add sauerkraut, salt, pepper, bay leaf and crushed red pepper, stirring. Place hot dogs on sauerkraut. Cover skillet, cook about 15 minutes, until heated through. 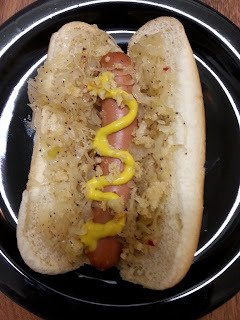 Toast hot dog buns, if desired, place sauerkraut on hot dog bun, place hot dog on sauerkraut and add mustard. Note: If using crushed french fried onions, add just enough to sprinkle on hot dog.